A year after New Balance announced it was making its first ever Android Wear smartwatch, it's finally on sale. You can get a New Balance RunIQ now. Taking on the likes of the Polar M600 and Moto 360 Sport, the $299.99 Wear watch is all set to get the Android Wear 2.0 treatment - if you get one right now it's 1.5 though. 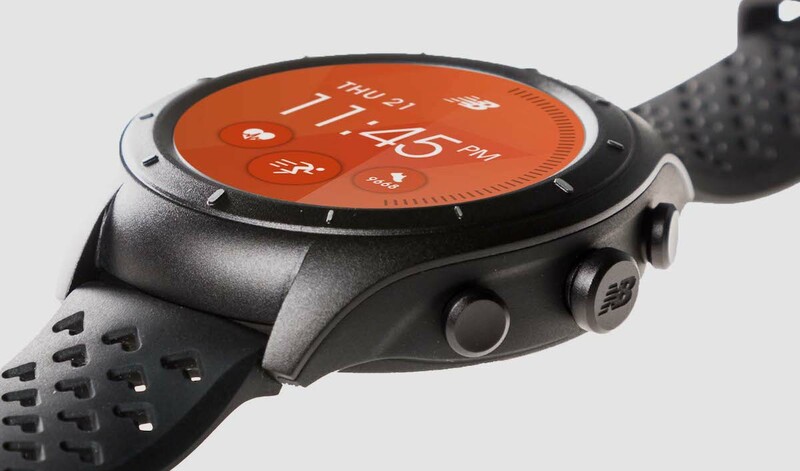 New Balance and Intel has decided to take the circular smartwatch design approach with the RunIQ available in matte black with a grey face. There's also the option to swap out the watch bands, which will be available in a host of colours including blue, red, pink and green. There's one additional band bundled in with the watch as well. It features a 1.39-inch AMOLED touchscreen display with a 400 x 400 resolution and 287 ppi, so it's be up there with the best that Android Wear screens has had to offer us so far in terms of quality and size. When you don't want to get your hands all over that touchscreen, the RunIQ has three physical buttons as an alternative way to get a workout started or control music playback features. The top one launches the Run IQ app and lets you start and pause an activity. The middle one is the home button and the one below that controls music and reseting laps during a workout. The good news for swimmers is that it's water resistance up to 5 ATM, so you can take it for a dip in the pool as well. This sporty smartwatch rocks the kind of motion sensors we're used to seeing crop up in your standard fitness tracker and the current crop of fitness-focused Wear watches. There's built-in GPS, an optical heart rate monitor for on the spot readings and heart rate zone training, plus an accelerometer and gyroscope. To take care of performance New Balance has gone against the Android Wear norm opting to follow in the footsteps of the Tag Heuer Connected and use an Intel Atom Z34XX processor with 512MB of RAM and 4GB of storage. That should be enough room to fit 50 hours worth of Google Play music if you were wondering. To take advantage of the ability to load on music, New Balance is partnering with Jabra who is launching a pair of PaceIQ wireless sports headphones that are optimised to work with the RunIQ watch and feature a dedicated Sports button to deliver real-time audio in-ear coaching. The RunIQ is set to run on the latest version of Android Wear, but the version on sale early February is running Android Wear 1.5. It'll work with iOS and Android phones and you can expect Android Wear 2.0 to give you the standard notification support, Google Now integration and the ability to sync music over Google Play (Android phone only). It will also work with new standalone apps. There's notification support of course when connected to Bluetooth or Wi-Fi, although iPhone users will not be able to access the Reply feature. Sorry folks. There's a MyNB app you'll need to download with big Strava integration to make it easier to upload and share workouts (running and cycling). There's GPS tracking letting you record routes, pace and distance. Additional metrics you can view from the watch screen during a workout include heart rate zones and cadence. In terms of battery life, the RunIQ includes a 410mAh battery and you can expect to get up to 24 hours on one charge and up to five hours when you're making use of GPS and heart rate monitoring. So it'll last a marathon, but it falls well short of the kind of stamina you'll get from a dedicated Garmin or Polar GPS running watch. The RunIQ is available to order now from the New Balance website, priced at $299.99. That's a little cheaper than the Polar M600, our current sporty Android Wear favourite. If you order one you'll get 3 months of Strava Premium to access of all of the fitness app's features. The PaceIQ smart earphones are priced at $109.99 and will also go on sale on 1 February.